You might already be using turmeric in your favorite Indian curries but if you haven’t tried adding it to your smoothies yet then you’re seriously missing out. Turmeric has been used in various cultures for centuries thanks to its powerful healing properties. It’s a significant source of curcumin, which is what gives the root its bright yellow color. Curcumin is well-known for its potent antioxidant and anti-inflammatory effects in the body. It’s also anti-bacterial, making it a great supplement for overall skin health. Fresh turmeric has a mild scent that’s slightly reminiscent of orange and ginger. On its own, the flavor tends to be somewhat bitter. However, in a smoothie it blends very well with the natural sweetness of fruit when used in small amounts. 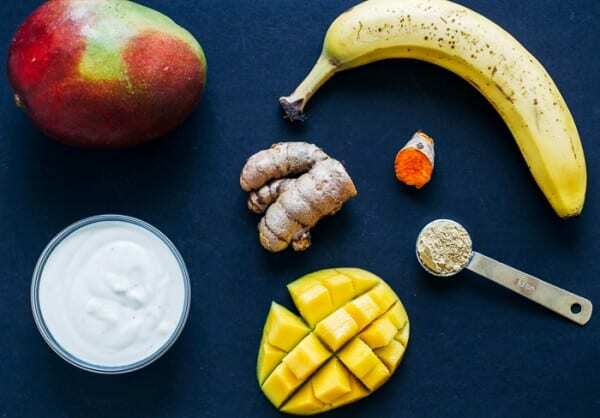 In this recipe, we’re combining frozen mango with banana, ground ginger and orange juice for a tropical flavor that brings out the pleasant undertones of the turmeric. Non-dairy yogurt helps give it a thick and creamy texture while also offering a source of plant-based protein. Using fresh turmeric is ideal since it’s in its least processed form but if you are unable to find it, ground turmeric will work in its place. Feel free to add a scoop of your favorite plain protein powder for an extra protein boost! 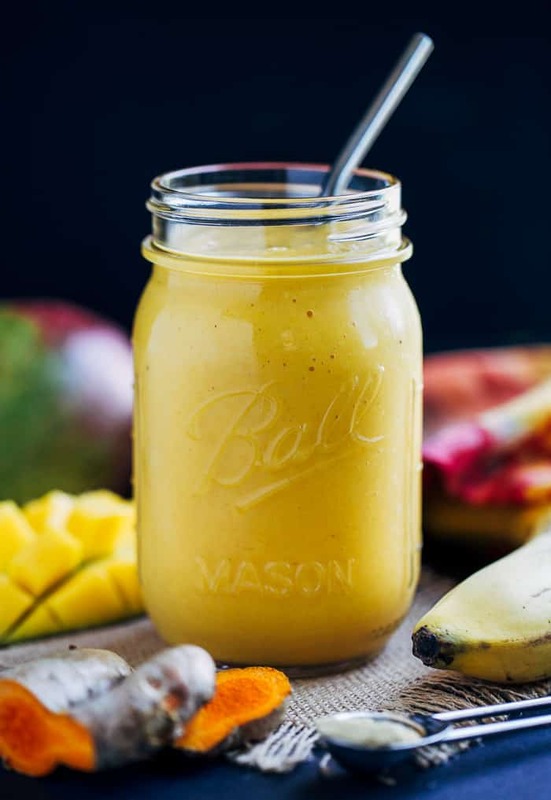 Enjoy the benefits of turmeric in this tasty tropical smoothie. In a blender, combine the frozen mango, frozen banana, non-dairy yogurt, turmeric, and ginger with the orange juice. Blend until smooth. Add more juice or almond milk as needed to thin. Looks very delicious and amazing photos…..
Is there a substitution for the orange juice?